A conservation group set up to save the Scottish wildcat – one of the most endangered animals in the world – is celebrating the success of its most productive season ever. It claims this shows its methods for protecting the wildcat from extinction are working and that they should be used as a blueprint for other areas of Scotland. Wildcat Haven was set up by a team of ecologists, wildlife experts, vets, teachers and landowners set up in 2008 to save the wildcat, which is threatened by cross-breeding or hybridisation, with domestic and feral cats. And the group’s chief scientific adviser Dr Paul O’Donoghue said they were very proud to have neutered 100 domestic cats over a 12-month period and extended the haven area to 800 square miles, covering Ardnamurchan, Sunart, Morvern and Moidart. He added that they were extremely pleased that no new feral or domestic cats had been seen at any of their monitoring sites in the past four months. Dr O’Donoghue said: “This is really encouraging news and shows that our approach of trap, neuter and return is working over a vast scale. “The litmus test is whether any new cats come into the area and the evidence is that no new cats are coming. 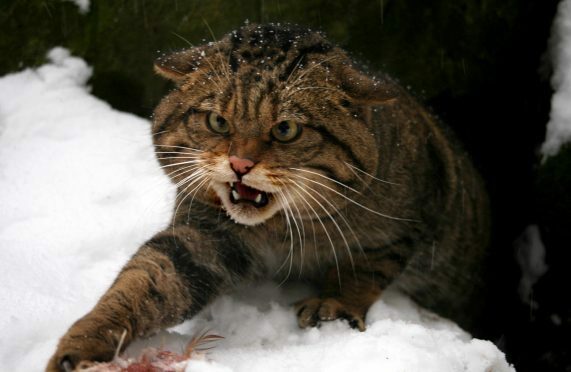 “It means that we are now confident that Scottish wildcats in the west Lochaber area can only breed with Scottish wildcats. He added that they were planning to expand the haven area, with a long-term goal of taking in 7,000 square miles of the Highlands, between Morvern and John O’Groats. Recent estimates place the number of Scottish wildcats remaining in the wild as low as 35, making it 70 times rarer than the giant panda. But Wildcat Haven is hoping to increase this to at least 250 by the time it has established the 7,000 square mile haven. Dr O’Donoghue pointed out that the group did not receive any government funding and relied solely on donations.